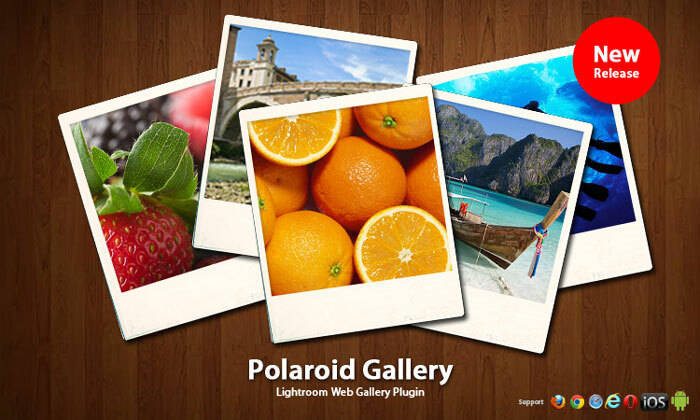 Polaroid Gallery is a Adobe Lightroom web gallery plugin. By HTML5 and CSS3 technology, no Flash plugin is needed. So, you can view the gallery on all mobile device and desktop which support HTML. Now photographers can make photo gallery which can view on billion of mobile device. With extremely "easy-to-use" interface, just a few click from the interface to create the gallery instantly. The gallery is design base on concept of responsive web design. The gallery can fit on most of the screen resolution. And it is using HTML5 and CSS3 which make it available on all mobile devices and desktop. This Gallery support auto layout for iOS and Android device. The layout will adjust when device orientation changed. The layout is optimzied for mobile screen resolution and touch control. This gallery design to work with both mouse base and touch base device. User can do nature touch and move on photos on tablet device. The gallery build in slide show feature. With this feature, you can showcase your photo easily to your audience. Easy to change theme color and background. Build in several photo them and backgorund for choosen. Include both full screen and a template a template for easy integration with your existing website. Beside custom the gallery within the Lightroom UI. You can also custom the gallery in your own way by CSS. This Photo Gallery is build with modern HTML5/CSS3 technology supported in most modern browser. No Flash plugin is needed for view. The plugin is compatible with Lightroom 2.x, 3.x, 4.x. Get a blank screen when working with Lightroom in Window?